Before me was a peak, and a waterfall the color of India ink slid or slithered over the brink, and was beaten into a blue-gray froth as it tumbled, and the wind held a fan of indigo droplets. The drops smoldered where they fell. It was not water. Call it a somethingfall. It was not abduction. I volunteered to go. You might wonder why the Hierarchs (they don’t call themselves “grays” or “LGMs”, obviously) used such crude methods. They want to do what we can imitate, obviously. I was glad for my windbreaker when I stood on the soil of the cold world beneath four suns. The first white giant was eclipsed by the second for a day. The other suns were red and dim as tail-lights. The surface was cracked, dried mud, and lopsided little crawly things swarmed in the cracks, but their movements were awkward, and they shivered. The jungle was blue-black. The leaves and flab-mounds and swollen vines were blotched and sickly. Some of the trees had eyeballs, but these were grown at random, not connected by nerves to any central brain. 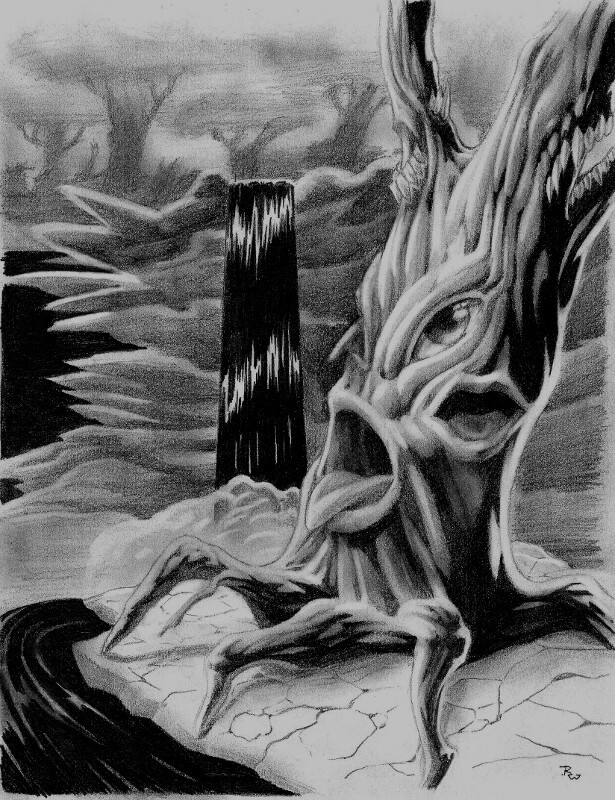 Where the droplets fell, the tree-things shrieked a piping noise. The star vessel was a crystal circle overhead that vanished when I looked at it directly. I could see it in my mind. Since I had just been aboard, it was “pastward” of me. Back on Earth I could not see into time, but the mind-processes of the Hierarchs had woken something in me. The Hierarch I called “Lollipop Guild” hovered naked next to me, his gleaming gray skull at armpit height. He raised a slender, shining arm and pointed, looking at me with eyes too large for his face, and deeper than outerspace. In his eyes, I saw the message: This is why. “Why what?” I asked, teeth chattering. I had not mastered their art of speaking without speech. A snake wallowed among the jungle roots. It had nine legs on one side, and could not walk. Its brain was carried in a bag or mantle of flesh that it dragged behind it as it limped. It licked the mud, but did not know how to chew. In his eyes, I saw that this world was one of the many unplanned ones scattered through the Orion Arm. The changes to their characteristics are by random chance. Those unfit to survive perish, and therefore do not pass along their defects. His lipless mouth was so small that it was only a pucker, but I saw it twitch into a sardonic smile. The Designers passed through this arm of the Galaxy long ago. Your race and mine share a common template: you were meant to learn our arts. I had wondered why the Hierarchs looked so much like us. The wind picked up. A revolting smell came from the jungle. Certain of the tree-things collapsed, mewling, because the bones inside their trunks were evidently not strong enough to support their weight. Worlds they did not touch are like this. Somehow, I understood that the Designers had left behind no clues. I cannot tell you the sorrow I saw in his huge, blind-seeming eyes then. Why did you call to us at night? Ah! We think this also. I realized that they had brought me all this way just to answer my question. The whole spaceflight, the long sleep, the strangeness of the wormhole, and seeing the other-time version of ourselves intersect with us when we surpassed lightspeed: all that energy spent just to show me this. He shed grief like heat from a stove. I wanted to sit, pull him onto my lap. We cannot take you to our leaders. They hide. Until we become like them, we cannot find them. 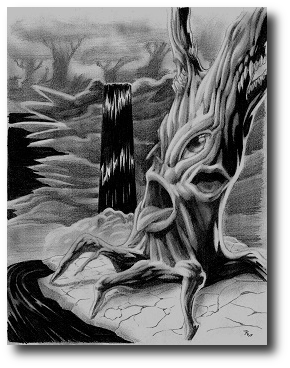 I saw one tree-thing claw itself up on crab-legs and wobble awkwardly toward the pool at the foot of the somethingfall. It had three mouths, each a different size, but its teeth and tongues were growing out of its upper branches, and not in the mouth-sockets where they’d be useful. It sucked at the liquid, uttered a horrific squeal, and fell over, kicking its three mismatched legs feebly. At my foot, a slug the size of a rabbit tried to hop, but it stumbled. Earth’s great beauty compels us visit her. I knew then why they had taught an Earth-girl their powers. Shuddering, teeth clenched, I picked up that greasy slug-thing, and looked into its future. I petted it until it was covered with rabbit fur. In 1984, Graduated from St. John’s College in Annapolis, home of the “Great Books” program. In 1987, he graduated from the College and William and Mary’s Law School (going from the third oldest to the second oldest school in continuous use in the United States), and was admitted to the practice of law in three jurisdictions (New York, May 1989; Maryland December 1990; DC January 1994). His law practice was unsuccessful enough to drive him into bankruptcy soon thereafter. His stint as a newspaperman for the St. Mary’s Today was more rewarding spiritually, but, alas, also a failure financially. He presently works (successfully) as a writer in Virginia, where he lives in fairy-tale-like happiness with his wife, the authoress L. Jagi Lamplighter, and their four children: Eve, Orville, Wilbur, and Just Wright. For more about his fiction, visit his sff.net page. Copyright © 2010, John C. Wright. Published under the Creative Commons Attribution Non-Commercial No Derivatives (cc-by-nc-nd) license.